African swine fever is very contagious & is killing pigs and wild boars in Africa, Asia and parts of Europe. No treatment is currently available. Let’s work together so African swine fever does not make its way to Canada! Your pigs are vulnerable to the deadly AFRICAN SWINE FEVER virus. Take necessary precautions to protect your animals. 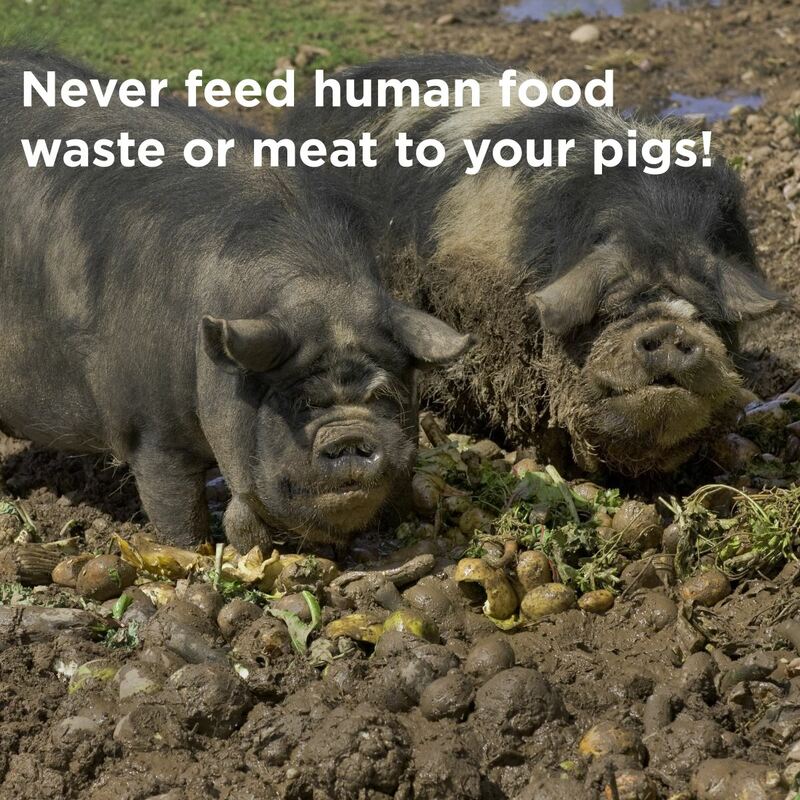 DO NOT FEED HUMAN FOOD WASTE OR MEAT TO YOUR PIGS! Although African swine fever cannot infect humans, even a trace amount from a contaminated pork product can kill your pigs and spread the disease. Be wary of where you dispose of your food waste so other animals, including wild boars, do not have access to it. If you feed your pig fruit and vegetables, make sure they have never entered a kitchen or been in contact with meat or products of animal origin. The virus can survive in fresh pork, processed pork products including cured, air dried, salted or smoked products for up to 300 days and even 1,000 days in frozen pork. The virus can kill pigs if ingested. African swine fever can be transmitted to pigs through contaminated food and by contaminated items such as clothing and footwear. When you travel, never bring back meat or pork products into Canada. Wash all clothing and footwear immediately after use in other countries. Even better, if you visit a farm or animals, don’t bring them back to Canada! 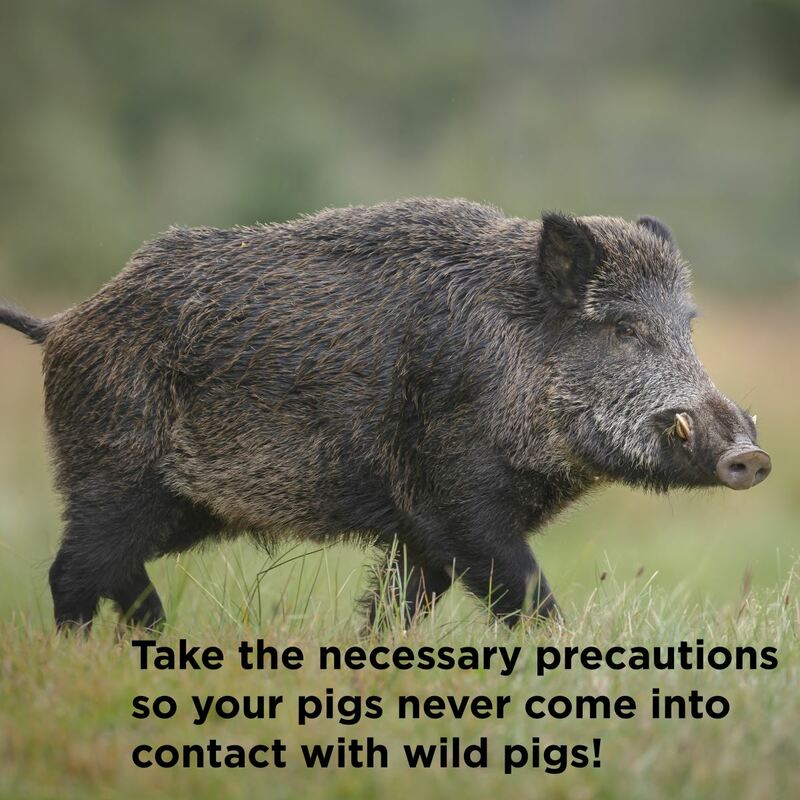 TAKE THE NECESSARY PRECAUTIONS SO YOUR PIGS NEVER COME INTO CONTACT WITH WILD PIGS! Although African swine fever is not currently present in Canada, wild boars can very easily spread a host of diseases to your pigs. If they have access to the outdoors, take the necessary precautions so your pigs never come into contact with wild pigs! Learn more about the virus and its symptoms. Find out how the disease is spreading in other countries and the risk factor to Canada. Find out what the Canadian Food Inspection Agency is doing, what pork producers can do, and what the Canadian Pork Council is doing.